Charlie did a post earlier about gelato (ice cream) and another about how well the Italian women dress. Today I couldn’t resist taking this picture. Two English (??) 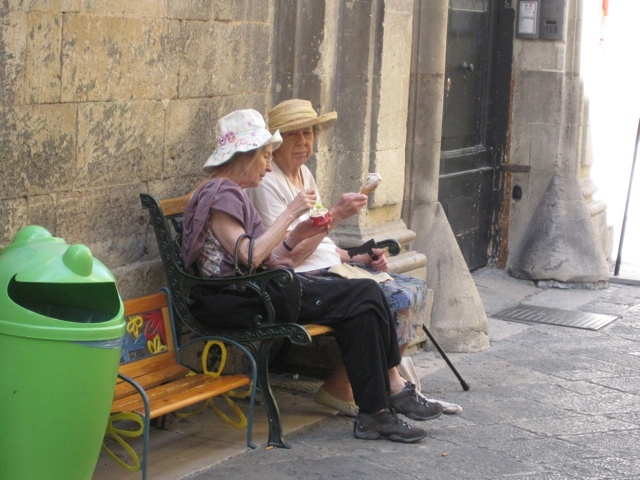 ladies in decidedly unfashionable yet comfortable clothes and floppy hats sitting on a bench outside a gelateria eating their ice cream. I was hoping they wouldn’t see me take their picture but think one of them may have.